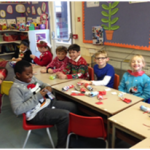 This week has been packed with fabulous Christmas activities. 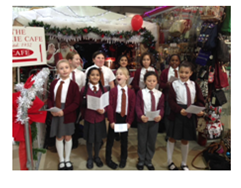 ‘Shoop’ conducted the school choir on Wednesday, as they sang beautifully for shoppers in Romford Shopping Hall. 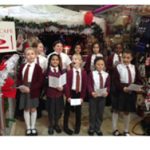 We had a collection bucket with us which Michelle, the Centre Manager, circulated amongst the shoppers. We raised a fantastic £106.62 towards the Playground Project. Thank you to Mr. and Mrs. Chagger and Mrs. McCormack for transporting the children and all the parents who came to support. Cinderella- You Shall go to the Ball! West End in Schools treated us to a fantastic pantomime in school on Tuesday afternoon. The children really enjoyed the show and the singing was amazing. What a fabulous time we all had at Brentwood Theatre yesterday: the show was fantastic and the children behaved really well. Please ask them about the show and who their favourite characters were. Each child has been given a free ticket to return to the show (accompanying adults and siblings will need to pay). 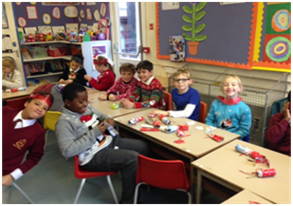 We had a lovely Christmas lunch today and enjoyed wearing our Christmas hats and jumpers. Thank you, Debbie, for cooking it for us! Our new netball team made a valiant effort against the very proficient Clockhouse team on Wednesday. Whilst they didn’t win, they showed spirit and determination. Thank you to Mrs. Fletcher for coaching the team and organising the match. It was lovely to see so many parents cheering them on. We are having trouble closing our front and back doors at the moment. They are due to be replaced in the New Year. Until then, please make sure the door is slammed shut when you leave (check by trying to open it after you exit). If you are unable to shut the door, please let the office know so that we can come and shut it for you. If you have anything large delivered for Christmas, please flatten the boxes and bring them into Reception so that they can be used for large paintings. Thank you. Commendations this week went to Neli Higgins for her independent story writing, Elaina Goodison for working hard in class, Harry Newman for good work on prisms and pyramids, Stevie Makepeace for a great effort in Nativity practice and Jeremiah Oyetunde for fantastic singing in Nativity practice. The Class 5 and 6 Work of the Week certificate was awarded to Daniel Davies for his moving and informative letter from a World War 1 soldier; The Class 1 and 2 certificates were awarded to Tommy Randall and Lexi Webb for a thorough maths investigation ; The Class 3 and 4 certificates went to Maansi Chagger for constructiong 3D shapes and Hermione McCormack for her Pythagorus poster; The Reception class Work of the Week was awarded to Adaora Emechebe for writing a great letter to Santa using her sounds and cursive writing. Well done to Imogen Snell, Oliver Mahoney, Mikey Snow, Devon Alexander and Jessica White for earning their place in this week’s Gold Book for excellent learning behaviour.